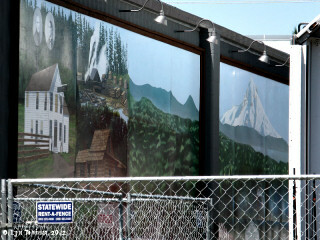 Click image to enlarge Mural, "Peaceful Vistas". 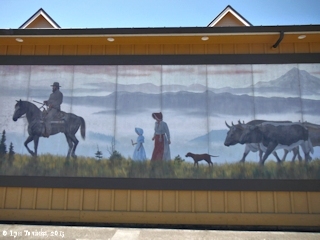 Mural depicts pioneer family on the Barlow Road, painted by Roger Cooke, 1993, located in Sandy, Oregon. Image taken July 17, 2010. 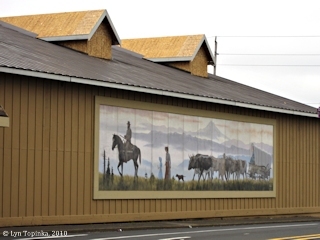 The Centennial Mural depicts the history of Sandy, Oregon. It was painted by Lee Lauritzen to commemorate Sandy's Centennial in 2011. The mural is 12 x 60 feet in size and overlooks Centennial Plaza. Scenes on the mural include the Revenue's 1875 Hotel, the Jonsrud Brother's 1914 sawmill, Salmon jumping in the Sandy River, and Mount Hood rising above the Sandy River valley. 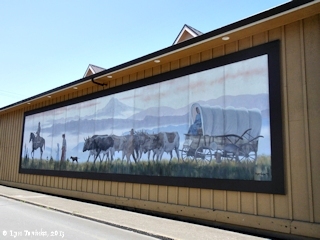 All images are painted on twenty-four 4 x 8-foot panels. 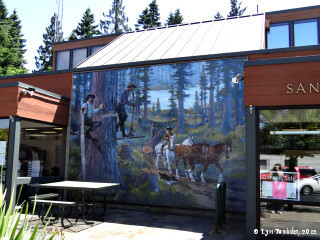 The mural was dedicated on June 4, 2011. Click image to enlarge Centennial Mural. Image taken July 13, 2012. 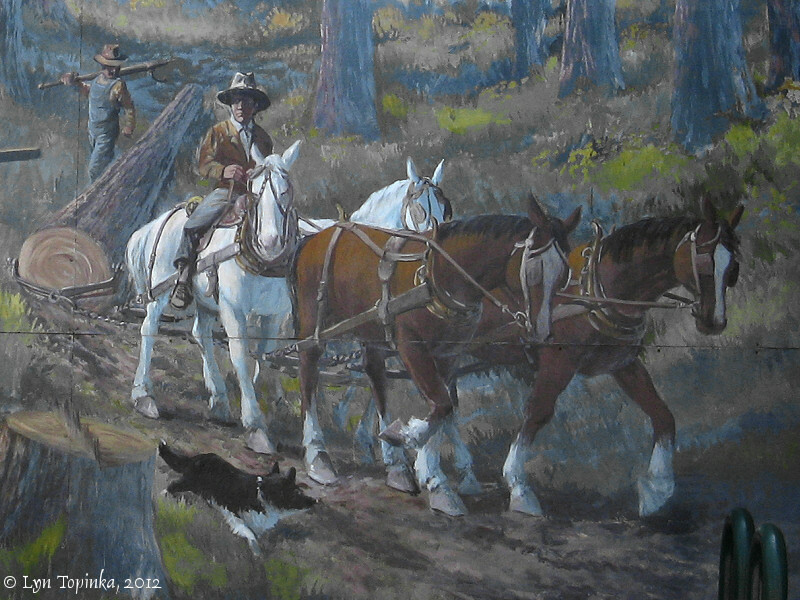 Click image to enlarge Detail, Centennial Mural. Portrait insets are of Francis and Lydia Revenue. Sawmill belonged to the Jonsrud Brothers. Image taken July 13, 2012. 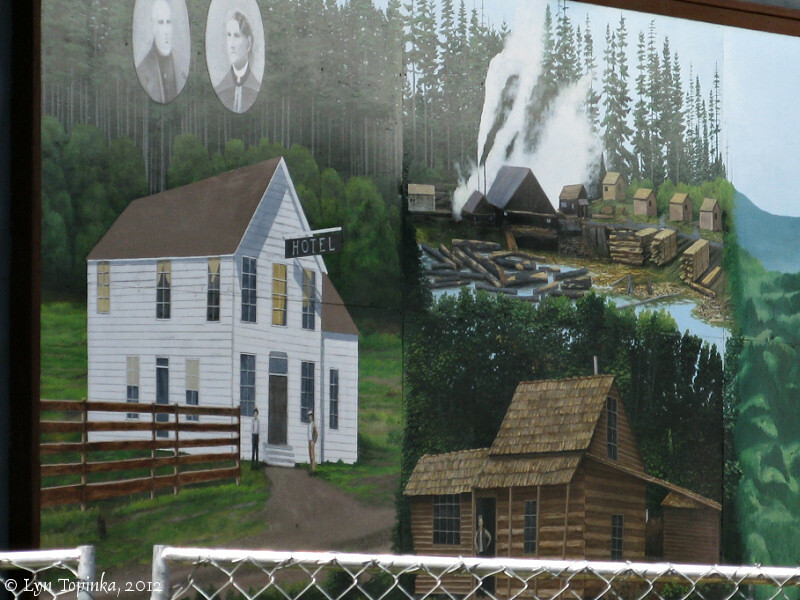 Click image to enlarge Centennial Mural. View from moving car. Image taken November 15, 2012. 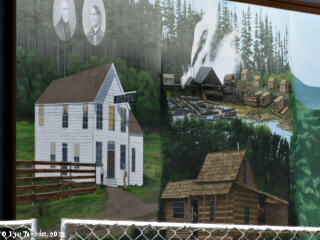 Click image to enlarge Centennial Mural. Image taken May 4, 2013. 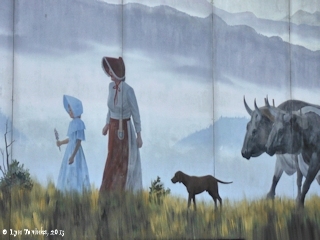 Click image to enlarge Detail, Centennial Mural. Image taken May 4, 2013. 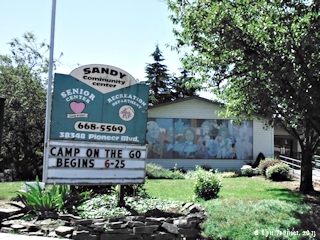 Click image to enlarge Sandy Community Center mural. View from moving car. Image taken June 28, 2013. 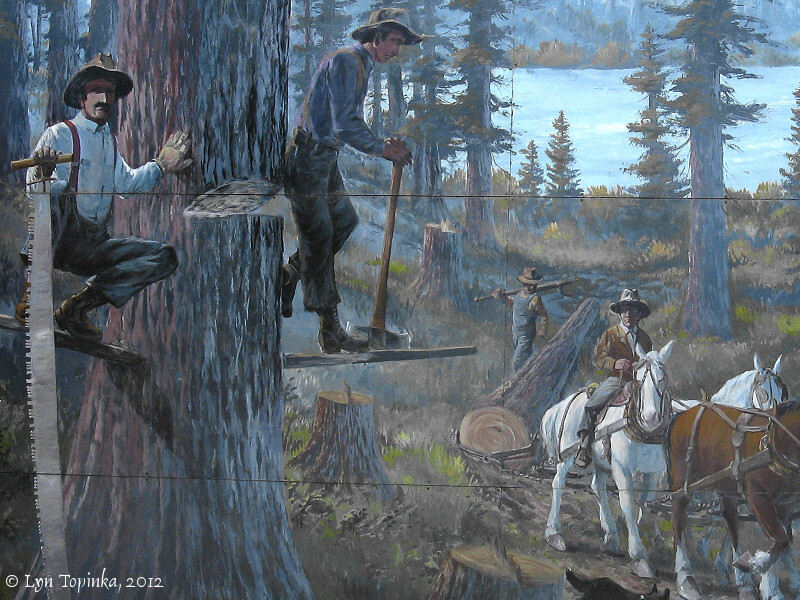 This mural depicts early logging techniques used in the Sandy area. It was painted by Robert Thomas in 1995 and is located on the front of the Sandy, Oregon, City Hall building. Robert Thomas also painted some of the murals seen in The Dalles. Click image to enlarge Early logging mural, City Hall, Sandy, Oregon. Image taken July 13, 2012. 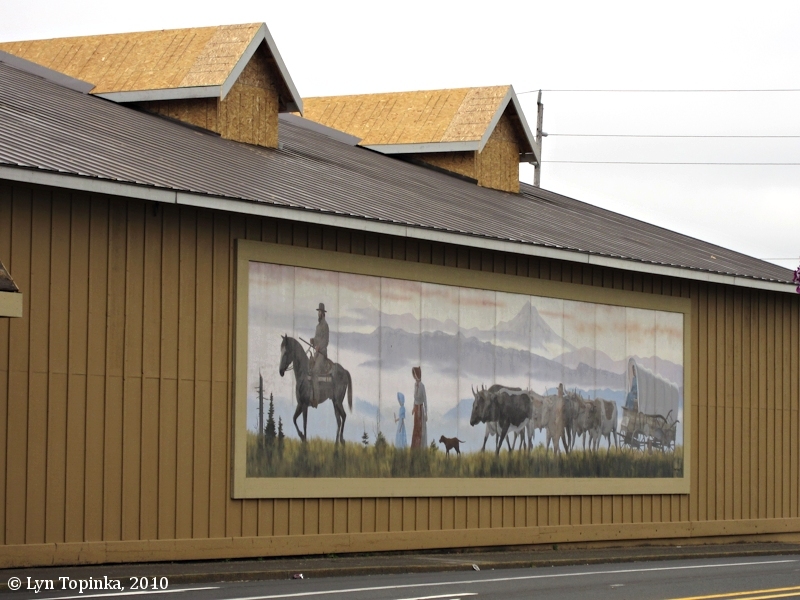 Click image to enlarge Detail, Mural, City Hall, Sandy, Oregon. Image taken July 13, 2012. The "Peaceful Vista" mural depicts a pioneer family on the Barlow Road. 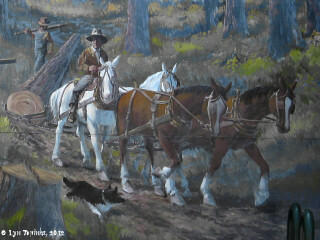 It was painted by Roger Cooke in 1993. 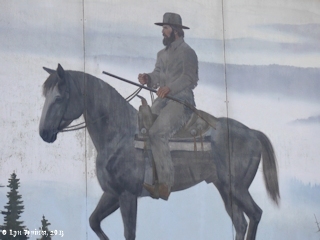 Roger Cooke also painted some of the murals seen in The Dalles. Click image to enlarge Mural, "Peaceful Vistas". Image taken July 17, 2010. 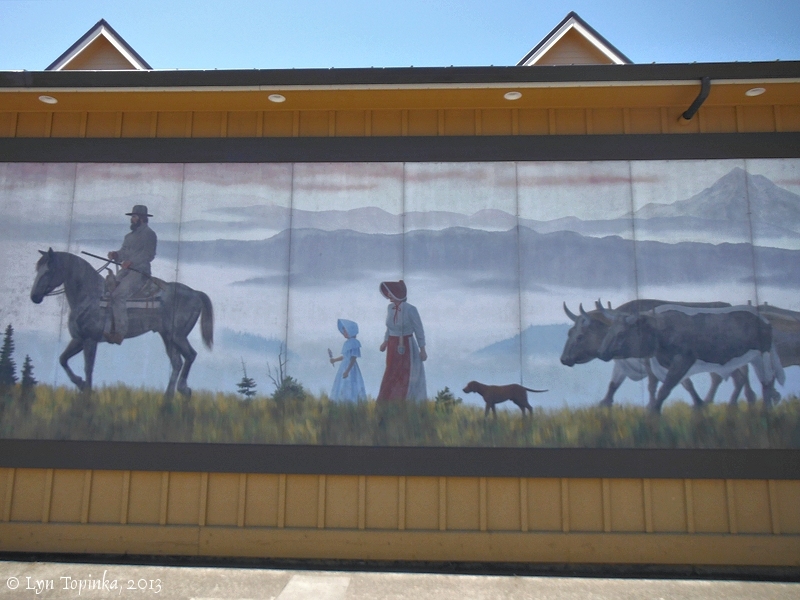 Click image to enlarge Mural, "Peaceful Vistas". View from car. Image taken June 28, 2013.